She was well-named-Sin-foul witch and raving beauty. 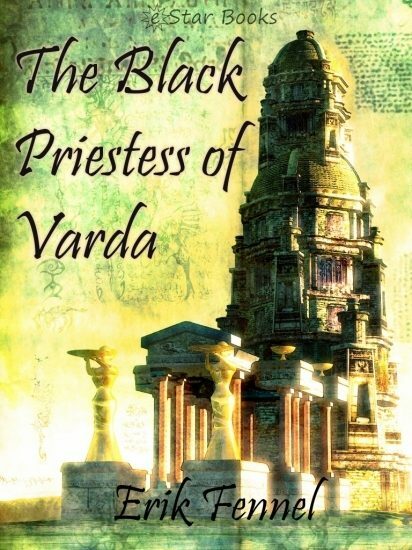 Black Priestess and beloved of Sasso, the Dark Power from another dimension who strove to capture, with her help, Varda, a lovely little world. Outlawed, sentenced to the Vat, a few foresters still defied foul Sasso's loveliest witch. A shriveled blood-red moon cast slanting beams through gigantic, weirdly distorted trees. The air was dead still where he lay, but overhead a howling wind tossed the top branches into eerie life. He was lying on moss. Moss that writhed resentfully under his weight. His stomach was heaving queasily and his head was one throbbing ache. His right leg refused to move. It seemed to be stuck in something. He was not alone. Something was prowling nearby among the unbelievably tall trees. He sat up weakly, automatically, but somehow he did not care very deeply what happened to him. Not at first. The prowling creature circled, trying to outline him against the slanting shafts of crimson moonlight. He heard it move, then saw its eyes blue-green and luminous in the shadows, only a foot or two from the ground. Then his scalp gave a sudden tingle, for the eyes rose upward. Abruptly they were five feet above ground level. He held his breath, but still more wondering than afraid. A vagrant gust brought a spicy odor to his nostrils, something strongly reminiscent of sandalwood. Not an animal smell. He moved slightly. The moss beneath him squeaked a protest and writhed unpleasantly. The thing with the glowing eyes moved closer. Squeak-squeak, squeak-squeak, the strange moss complained. And then a human figure appeared momentarily in a slender shaft of red light.